We have come to understand that healing is an evolutionary process. The difficulties in our lives such as disease, pain and suffering ~ be they mental, emotional or physical in nature ~ contain the very seeds of our evolution. In working with and through these challenging energies we heal, and in doing this we evolve our human family. Much speculation, investigation and experimentation has filled the mind of humanity with many ideas as to what is healing. Some of the theories, practices and experiments are correct and some are incorrect. However all this lower mindfulness can make it difficult for the soul to enter our consciousness and do its work. The nature of healing at its most essential level consists of releasing the soul so it flows through us. Much like science attempts to release the energy of the atom, the conscious healer endeavors to release the energy of the soul. Understand this truth and you understand the power of the soul to heal. The physical plane methods and practices so long cherished are not lost or abandoned. They have their proper place working in the alignment of the soul. 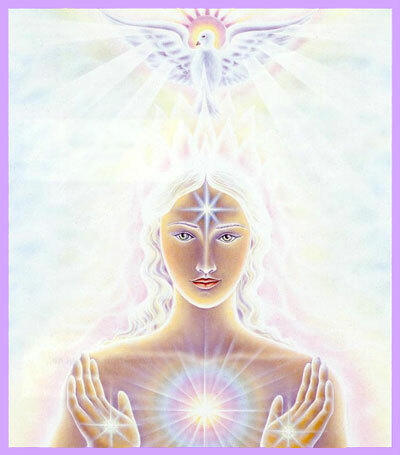 As conscious beings and world servers, in response to the energy of the soul we are called forth as healers. This call can take many forms, however the goal is always the same ~ to end suffering, to promote goodwill, and to cooperate with the purpose and the plan of God. A group of SouledOut co-workers were so called. We came together in a group to radiate the healing energy of soul on places of darkness and difficulty in our world. The way this group came into being was a healing in and of itself. In 2001 our group, which had been meeting weekly for over 15 years, was discussing the possibility of meeting every other week, as much of the recent work was being done in small groups outside of the weekly meetings. One member very willfully stated that he felt the group should continue to meet every week. This was important both to him and the continuity of the work. The other group members were a little taken aback by the force of his feelings. This energy must be understood as each members expression is vital and valued in group work at this level of meditation. Another member suggested, we must have purpose to come together and presently our work is best being done in small groups. What would be our purpose? It was then suggested that with all our work on this website, we had little time to do group healing work. It was as if all this had to happen so that the ideal of a dedicated healing group could be born. Light poured into the room, the soul energy was fully present and each member said, "yes." The tension was gone, direction and purpose had been found. The work began for developing a group healing ritual. We hope you can see the very birth of this healing, for we could not think of a better way to begin. At the next meeting, after two weeks of meditation and study, ideas poured through and the group healing ritual was created. At the core we hold that healing is brought about when the life of the soul can flow throughout every aspect of the being, and can then vitalize it with its potency and eliminate congestions and obstructions which are the main source of disease and suffering. (*) The mode we chose is radiatory healing. This requires a conscious individual alignment by each member with the group soul. This method we chose to utilize initially was to link heart, soul and brain in a triangle, and then aligning with pure motive, lacking any judgment, inspired by a loving heart, with all connected souls cooperating in the healing. The groups soul links with the soul of the being or group to be healed. Revealing the soul's plan and purpose in and through ___name___. And may all connected souls cooperate with this plan and purpose. The ritual itself is initiated by a group member who brings a request for a healing. This may be for an individual, a group, or a world problem. The member gives a brief description of the known healing crisis, and then if all members are in agreement to proceed with the healing, as one person rings tingsha bells to clear the space for the radiatory work, this healing mantram is intoned by all, using the name of that to be healed. After the mantram is said out loud by all present, a period of focused group meditation follows, this typically lasts from 3 to 10 minutes. During this time that which is being worked with appears in the meditation. The group radiates it with the love of the one soul, seeing that all connected souls who can aid in the healing are called forth to help. Impressions of the nature of the healing pour into the group. When all members have completed their mediation the mantram "Is it so? It is so" is intoned in unison. Then each group particpant, if inspired, recounts their impression of the nature of the problem and the healing energy that was impressed. A remarkable consistency of impressions has occurred in these efforts, with individuals getting identical words, concepts or images. Frequently the member who brought the healing request will make notes to be shared with the recipient of the healing, engaging their conscious cooperation with the healing energies. Then to seal the radiatory healing, the tingsha bells are sounded once again as the group closes the process with a resounding intonation of "Is it so? It is so!" We can truly report that healings have occurred, with remarkable shifts of energy. The impressions registered and shared have provided good counsel to those we have worked with. It is very important to note that we all have agreed that we do not pray for or ask for specific outcomes. We invoke the soul to do its work without judgment or attachment. When we truly open our hearts and minds to this process of healing, we let soul expression inhabit our lives, and in doing this we heal and evolve our human family. We invite you to participate in this great work, feel free to use this ritual that we have carefully and consciously developed. We invite you to share your healing work with us. We were introduced to the Power of One vigil by a spiritual friend at a time when a Safe Space member was about to undergo surgery. We received the following email and a prayer circle was formed. I have been guided by spirit to hold a Power of One Vigil for the next week for our friend who is about to undergo surgery, and I hope you all will join me. Power of One vigil means that the participants involved hold a unified vision, a thoughtform of unity consciousness and the light of God over an individual or group 24 hours a day. Participants take a 2 to 5 hour shift and agree to hold unity consciousness over that person, whether they are in formal meditation or at their job. If you have a 2 am shift and you go to sleep, then you align with your soul and hold the unity picture on the inner planes. The picture I am holding for our dear friend is that her total process is held in unity, light, God, love, and that the operation is divinely guided. I will be holding this picture in my consciousness from 6 am to 9 am starting now and I invite you all to join me, pick some hours in the day and email me your hours. The power of many holding the One vision is astounding, and together we have the power to create an incredible shift in consciousness and manifestation. This prayer vigil became an extension of the group healing work we were already regularly doing at specified gatherings. It was natural for those participating to say our group healing mantram during our Power of One shift. We can truly report that healings have occurred, with remarkable shifts of energy. The impressions registered and shared have provided good counsel to those we have worked with and served. Many have shared with us how of the energies of love and light generated by the Power of One have illumined and transformed the challenges that brought them to the group for healing. Some have also reported that when facing a similar or the same challenge for a second time, the experience was definitely more sacred with the Power of One being applied to their life. We have found that this way of prayer / meditation has been universally accepted by all faiths and practices. This ritual brings groups together in time of need for conscious cooperation. Group Work is a hallmark of our age and offers potent rewards for those practicing and receiving these energies. To read about the experience and results of a Power of One vigil, click here. "A prayer circle is a group of people holding the same intention for transformation. Through the power created by their prayers an energy field is formed, and is held in the oneness and the unity of the Divine. The more people there are holding the intention, the more powerful and effective the field is, to create change. We also call this the Power of One. When one person offers a prayer, it is as though everyone in the circle is offering the prayer and the effect is magnified." * Alice Bailey wrote, in Esoteric Healing (p. 17), "The true and the future healing is brought about when the life of the soul can flow without any impediment and hindrance throughout every aspect of the form nature. It can then vitalise it with its potency, and can also eliminate those congestions and obstructions which are such a fruitful source of disease." ** The name of the person, family, group, or any other subject to which the group wishes to send healing. We suggest the practice of including a healing for larger, world causes or events at every healing gathering.